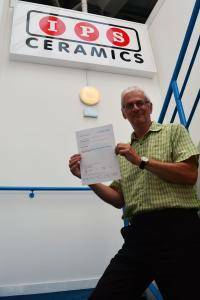 IPS Ceramics has just successfully been re-accredited under the updated ISO9001: 2015 standard for quality management systems. ISO9001 has its roots in BS5750 which was first published in 1987, updated in 1994, again in 2000 and in 2008. The current version was published in September of 2015 and certification to the old 2008 version will cease to be valid once the transition period ends in September 2018. Brian Wycherley, Technical Manager, explained that “The 2015 update introduces a much more integrated approach to the quality system, with a much greater emphasis on leadership involvement and a focus on the organisations key objectives”. Lucideon carried out the independent audit of the IPS quality system required for ISO9001 accreditations in June 2018.